Today I found out the name for the dwarf planet Pluto was suggested by an 11 year old girl. 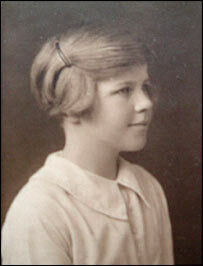 The girl was Venetia Burney of Oxford, England. Venetia’s great uncle, Science Master of Eton Henry Madan, in 1877 suggested the name for the two dwarf moons of Mars, Deimos and Phobos (fear/panic and dread/terror). This was referencing the fact that Deimos and Phobos were twin brothers, the children of the god Ares (Mars in Roman mythology), specifically being the offspring of Ares and Aphrodite. Because an 11 year old girl suggested the name Pluto and the Disney dog, Pluto, first appeared around the same time, it has given rise to the myth that Venetia came up with the name after the cartoon dog. The fact of the matter is that, while the dog did appear in 1930, the same year Venetia suggested the name Pluto, his original name was “Rover”. He didn’t get the name “Pluto” until Moose Hunt, in April of 1931, about a year after the planet was named. So how did she really come up with the name Pluto? As people so often did in that day and age, and not so much now, Venetia and her family were gathered around the table eating breakfast on March 14, 1930. Venetia and her mother were living at Venetia’s grandfather’s house in North Oxford as her father, Reverend Charles Fox Burney, Professor of Interpretation of Holy Scripture at Oxford, had died when she was six years old. Professor Harlow Shapley, Director of the Harvard Observatory, announced today that the Lowell Observatory at Flag-staff, Arizona, had discovered a ninth major planet. The planet, which has not yet been named, is beyond Neptune. It is probably larger than the Earth, but smaller than Uranus. The discovery confirms the belief of the late Dr. Percival Lowell that such a planet existed and was in fact the result of a systematic search of several years in support of Dr. Lowell’s belief. Professor Shapley calls the discovery the most important since the discovery of Neptune in 1846. Of course, they got the size of Pluto wildly off in the above, but the fact that the planet had not been named yet brought the topic of discussion at the table around to what it should be called. Venetia was well familiar with Greek and Roman mythology, and further had recently been acquainted with the planets and their relative distances from the Sun. After thinking about it for a minute, Venetia stated she said, “I think Pluto would be a good name for it.” Pluto is the god of the underworld, who could make himself invisible and generally dwelt in a place that sunlight doesn’t reach; so it seemed a fitting name for a dark, remote planet. Her grandfather thought it was such a great name, that he immediately went and suggested it to a friend of his, Herbert Hall Turner, professor of astronomy at the University of Oxford, who was attending a meeting of the Royal Astronomical Society (RAS) in London at the time. There was already a heated debate in Flagstaff and at the RAS meeting over what to call the new planet, but nobody involved had thought of Pluto. When it finally came to a vote as to what to officially name the newly discovered planet, it was unanimous- Pluto. I really believe that had Venetia been under a less capable and enlightened teacher than yourself, the suggestion of Pluto would not have occurred to her, or, if made, would have been just a vague guess. As it is, her acquaintance with some of the old legends of Greek and Roman deities and heroes, and that ‘nature walk’ in the University Parks, by which she was taught the relative spaces between the Planets and the Sun, and the gloom of distance, enabled her to grasp at once the special elements of the situation, and to be the first to make a suggestion so reasonable as to be accepted (it appears) by the whole world of Science. Whether she actually thought in such depth about the name or not, the scientists who ultimately did pick the name did think about those things when naming the planet. So finally, on May 1st, 1930, the director of the Lowell Observatory in Flagstaff Arizona, Vesto Slipher (Venetia, Vesto, Falconer… everybody back then had awesome names…), announced that the name of the ninth planet would be Pluto. Her grandfather also donated a “scrap of paper” and sent the letter noted above to her teacher, Miss Claxton, “… in grateful recognition of your [her teacher] share in Venetia’s triumphant naming of the new planet.” The money he sent with the letter was used to purchase a gramophone for use in teaching Music Appreciation. They named the gramophone “Pluto”. All will realize that our part in this was small, and that much is due to Venetia’s Mother, who herself taught Venetia… and steadfastly sought the best for her. But I venture to think that this letter will be an inspiration to others as it was to me, showing as it does how big doors swing on little hinges. Venus is named after the goddess of love. It is thought this planet got its name from the fact that it is “pretty” to look at as the third most bright object in our solar system in the sky as viewed from Earth (after the Sun and the Moon). The name of the goddess, Venus, probably comes from the Proto-Indo-European root *wen-, meaning “to strive after, wish, desire, or be satisfied”. Before it was discovered that Uranus was a planet, it was thought to have been a star. How Do Planets and Moons Get Their Names? I already knew this one!, “Me” so smart. I wonder if Venetia lived to see her planet “demoted”? She must be rolling in her grave. Pluto will always be a planet to me! Angrily shaking fist.